The scheme was built in Summer 2015 with stepped tracks on both sides of the road. It was very well received. See our report of an informal inspection. Camden consulted on a southern extension from Crowndale Road to Midland Road in October – November 2014. See our discussions on CycleScape. The drawing on the left is from the consultation. The southbound bus stop is like those in RCS. Camden is looking at island bus stops for both of the stops. The bus stops in Lewes Road Brighton are a good example. For the southbound bus stop, the stepped track offers a similar solution (see the drawing below). Note that the kerb where the bus stops is in a straight line with the outside of the stepped tracks. The design of the bus stop at Chenies Place was criticised on the grounds that the lane behind the bus-stop is angled very tight after the stop and emerges into the traffic We discussed several layouts for this bus stop e.g. the track emerges from the island and then crosses the side road on a raised table. Agreed that the northbound route should go via Goldington Crescent and that there should be no northbound cycle infrastructure between here and St Pancras Way. 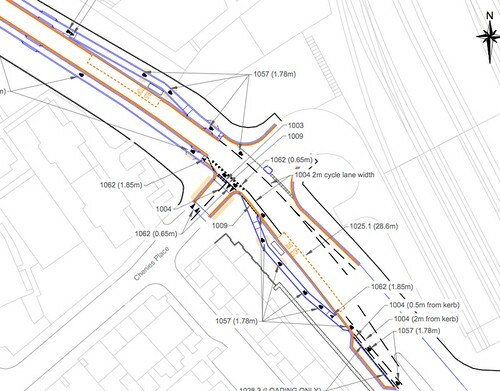 A cycle lane should be provided between St Pancras Way and Royal College Street leading to an ASL for westbound cycles on Crowndale Road but omit the ASL for right turning into Royal College Street. March 2014 concern about the bus stop bypass close to Chenies Street. 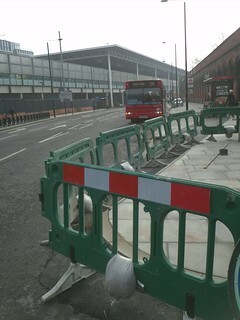 The photo on the left shows the cycle lane behind the island emerging in front of the bus. 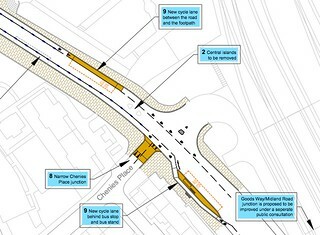 The drawing on the right shows that there will be white lines indication the cycle lane. However we believe this is unsafe. “We still feel that there is a perceived and possibly real danger to cyclists rejoining the carriageway in front of the bus stop, particularly from vehicles turning left while a bus is stopped, where cyclists may not be visible. We think that a painted lane is insufficient.